Jimbaran is a quiet, local, laid-back area in the south of Bali. The town started out as a peaceful fisherman’s village but it grew into a sought-after resort area with lots of cafes, restaurants, spas and luxury villas. Jimbaran has got a great mix of local rural life and touristy hot spots. There is one thing everybody loves about Jimbaran: its beautiful sunset bay where you can keep on munching on freshly grilled seafood. The location is strategic, not only towards the airport but also famous tourist towns like Kuta, Seminyak and Sanur. On top of that, Jimbaran is home to some of the island’s most beautiful beaches. It makes a wonderful holiday destination for families with kids and romantic couples. Jimbaran Beach features golden sands and calm blue waters, very safe for swimming. This beautiful, lively beach is ideal for lovely salty sea days, having fun with the kids swimming, building sandcastles, kicking a ball and so on. 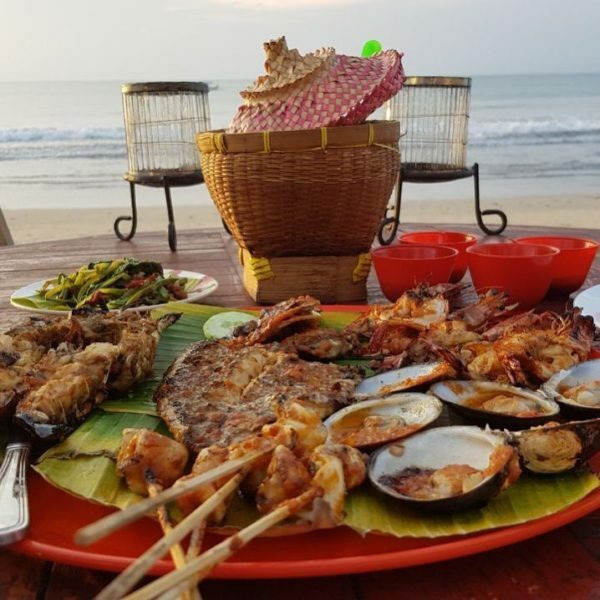 Local warungs (humble eateries) and famous resorts such as The Four Seasons are located right next to each in this lovely village, so you can easily grab something to eat or sit down for sundowner drinks to the view of the infinite ocean. Curious about other beaches in Bali? Check out our Bali Beach Guide. Balangan Beach is found at the bottom of a limestone cliff in between Jimbaran and Uluwatu. It is a pristine crescent bay with powdery white sands and stunningly blue waters. There are simple beach huts built along the shoreline, serving simple Indonesian meals and cold drinks. Balangan Beach is a beloved surfing spot and during low tide, a magnificent seascape of rocks and little bathing pools reveals itself. You can even walk to Dreamland Beach which lies just on the other side of the cliff. On the way, you can spot the weirdest little crabs and other creatures of the sea. Spend the day surfing, swimming and collecting seashells and stick around for cold Bintang beers and sunset in the afternoon for a perfect beach day in Bali. 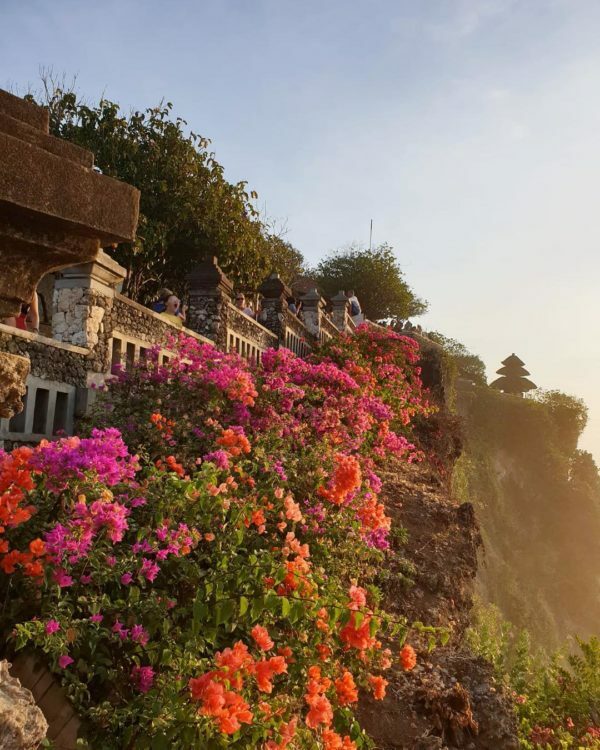 The Uluwatu Temple sits on top of a high limestone cliff, just a short drive from Jimbaran. 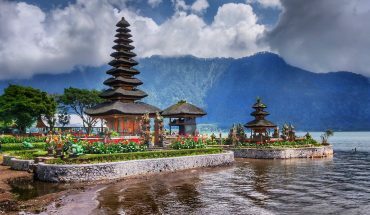 It is one of the most important sea temples in Bali, keeping evil spirits from the ocean away from the mainland. You can walk along the cliff, watching the ocean waves crash onto the rocks down below and take some stunning photos with the temple in the background. There is also a monkey forest for close encounters with local wildlife but do watch your belongings for these cheeky macaques love to steal sunglasses, cameras and phones from your hands or out of your bag. As the sun sets, the place has an almost magical feel with awe-inspiring ocean views. You can also get tickets for the sunset Kecak Dance, a traditional performance with costumes, music, drama and theatre. Lots of fun for young and old. 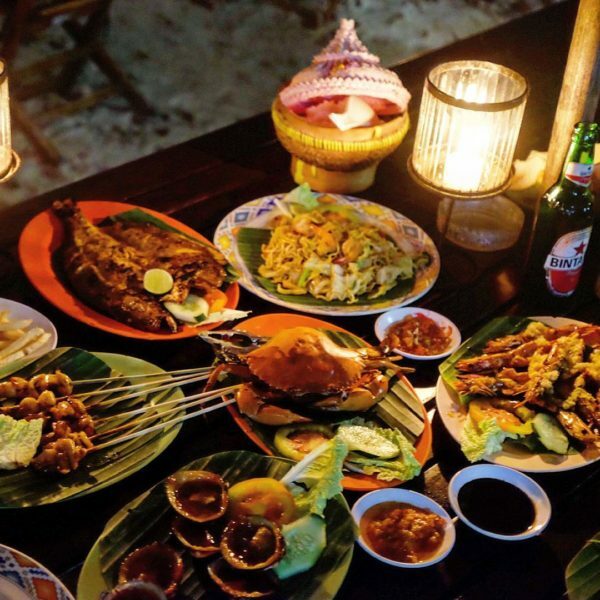 One of the things you cannot miss during your holiday in Bali is a seafood dinner in Jimbaran. It is one of the main tourist attractions in town and after sunset when thousands of lights are flickering all around and above this beautiful bay, the setting is just perfect for a romantic dinner. Fresh red snapper, prawns, squid, lobster – you name it. If you like seafood – this is paradise! This cultural park sits on 250sqm of land, just off the main road that leads from Jimbaran to Uluwatu. 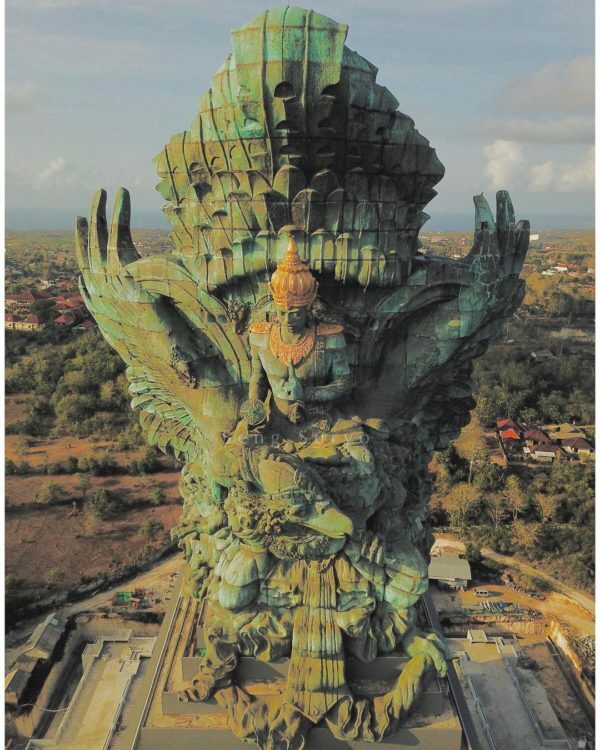 Garuda Wisnu Kencana Cultural Park is home to a giant 145-meter tall statue of Vishnu, an important Hindu God sitting on top of the Garuda Bird. To see this and other statues up-close is already impressive but there are also lots of cultural performances to admire at the amphitheatre inside. The admission to the park is Rp. 75,000 (excluding tickets for performances and such). GWK Cultural Park, Jl. Raya Uluwatu, Ungasan, Kuta Sel., Kabupaten Badung, Bali. Open every day from 8 am – 10 pm. This stunning white sandy beach turns into a seaweed-covered stone reef during low-tide, creating lots of small natural bathing pools. 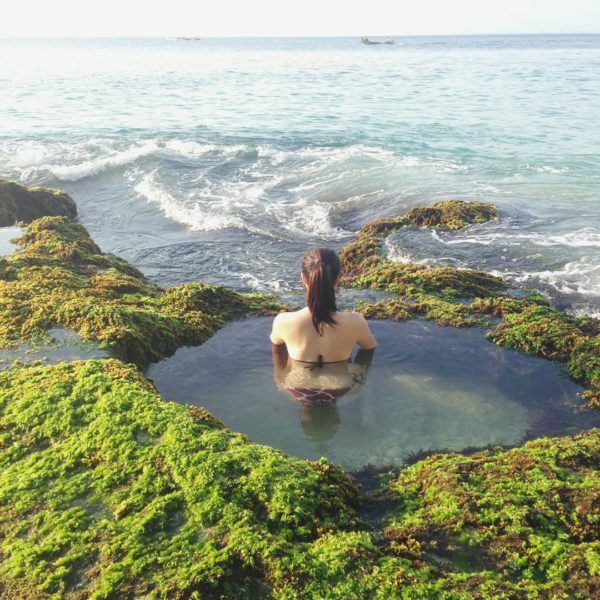 As waves overflow these pool with water, it feels just like sitting in a jacuzzi, overlooking the ocean. Stick around for sunset if you can, it is an impressive spectacle of nature to take in! Jungle Play Bali is an outdoor playground where your kids are bound to have an amazing time. 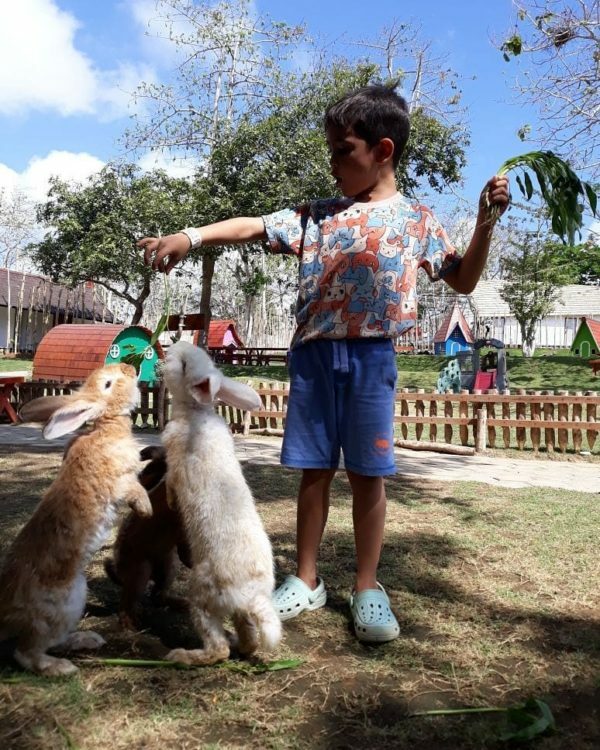 Open-air and spacious with climbing racks, little wooden playhouses and big rabbits to cuddle, Jungle Play Bali is the ultimate playground and it is located in Jimbaran. There are also activities and workshops for your little loved ones. Reasons enough to check this place out if you are staying in Jimbaran with kids. Jungle Play Bali, Jimbaran HUB, Jl. 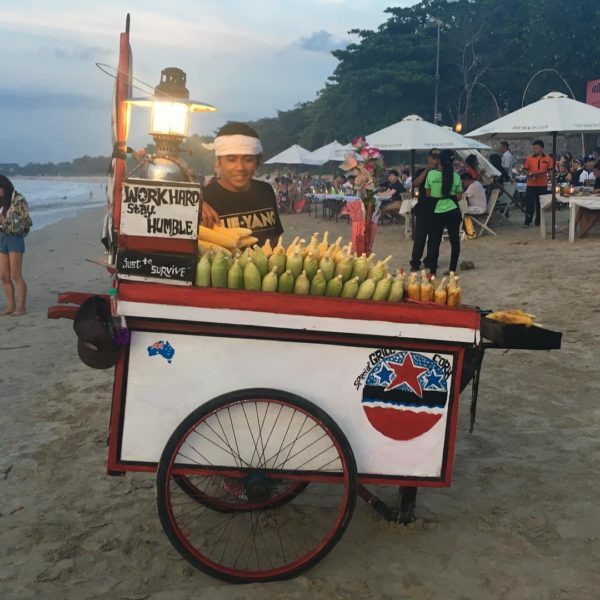 Karang Mas, Jimbaran, South Kuta, Badung Regency, Bali. Contact: +62 878-6355-0067. Open Tuesdays to Sundays from 10 am – 6 pm. This rock bar sits on top of a cliff, 14 meters above the ocean, making it a true and quite impressive ‘rock bar’, indeed! 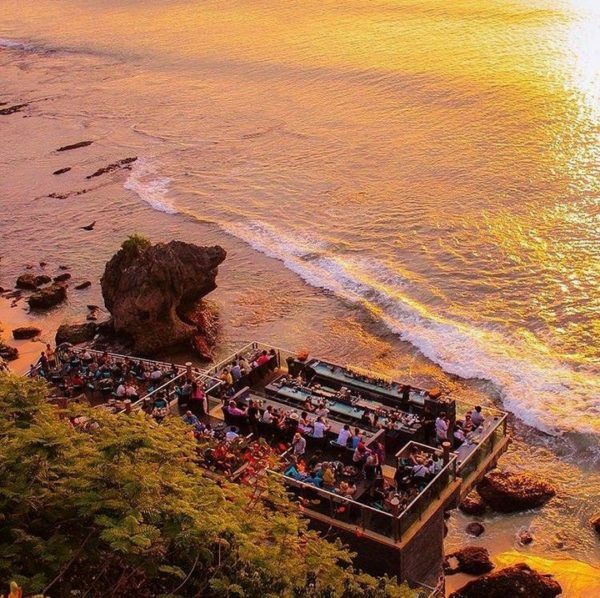 Located at Ayana Resort and Spa Bali, this is an amazing spot for sunset drinks with sunset and ocean views to blow your mind. Rock Bar Bali has been voted as one of the best bars around the globe by CNN and The New York Times. Excellent signature cocktails, renowned DJs, delightful tapas and dinner, this is a must-visit sunset hang-out while staying in Jimbaran! Rock Bar, Jalan Karang Mas Sejahtera, Jimbaran, Kuta Sel., Kabupaten Badung, Bali. Contact: +62 361 702222. Open every day. Monday to Thursday from 4 pm to 12 am & Friday, Saturday and Sunday from 4 pm to 1 am. Bring a little bit of France to your holiday in Jimbaran, Bali. 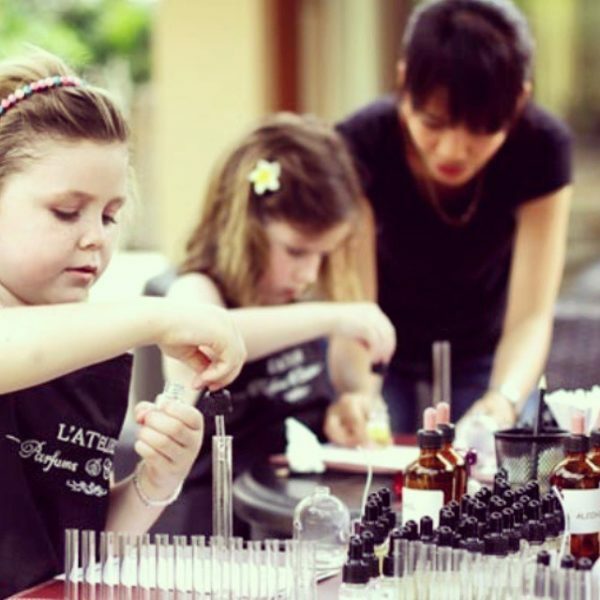 At L’Atelier Parfums & Creations (Located inside Ayana Resort & Spa), you can learn how to make your own perfume. It is one amazing journey of scents where you will be working with fresh locally-sourced ingredients to make a perfume that suits you personally. A unique scent is created by your own hands and you get to take a bottle home with you. Kids are welcome to join. L’Atelier Parfums & Creations, Ayana Resort, Jl. Karang Mas, Jimbaran, Kuta Sel., Kabupaten Badung, Bali . Contact: +62 361 702222. Open every day from 10 am – 9 pm. 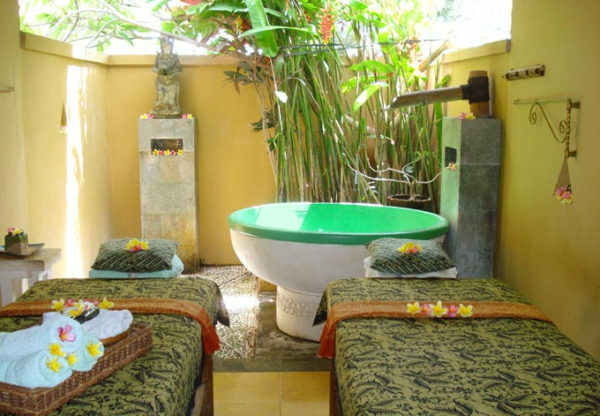 At some point during your holiday in Bali, it is time to make a trip to the spa. Jimbaran has got some beautiful luxury spas where you will get pampered inside out and it won’t break the bank. Experience the full body Balinese massage, get a facial, cream bath hair spa, a manicure and pedicure and you will feel brand new. You can also get spa therapist to come over to your Jimbaran villa if you don’t feel like leaving your private little paradise retreat on paradise island. 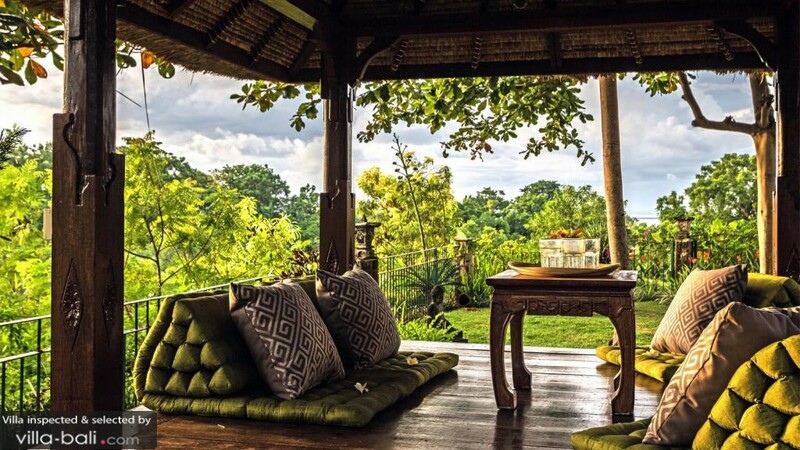 Learn more about traditional Balinese spa treatments here. 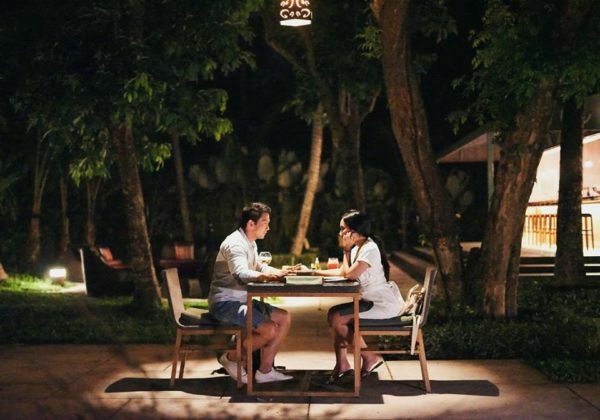 Cuca is a casual dining venue located in front of Kayumanis Jimbaran Estate and Spa. The restaurant serves tapas prepared with fresh ingredients from local farms and there are plenty of vegetarian options to suit everybody’s diet. The restaurant features an interactive food bar, a garden lounge and dining room. The food bar is meant for cocktails and tapas, great for couples who love to sit down for a chat while taking a peek into the chefs’ kitchen. The garden lounge makes a nice dining setting for families with kids and the dining room is perfect for chic dinner gatherings of all kinds. Fresh seafood on the beach – there is no place better to enjoy a feast like that than at Made Bagus in Jimbaran. Now, there are over 30 restaurants lined up on the beach of Jimbaran Bay but Made Bagus offer the best value for money. The restaurant is located behind Le Meridien Jimbaran Bali, away from the main seafood strip. There are no scams, the food is fresh and the service is friendly. Make sure to get a table before sunset time, it makes a lovely evening out! Made Bagus, Jl. Four Season, Jimbaran, Pantai Muaya, Jimbaran, Kuta Sel., Kabupaten Badung, Bali. Contact: +62 361 701858. Open every day from 8 am – 10.30 pm. Balique is a cool vintage cafe and restaurant, serving outstanding Indonesian food. Featuring traditional architecture and a decore ruled by vintage artefacts and antiques, having dinner here feel like dining in a chic Indonesian house. The food is served beautifully and the flavours are authentic and exotic. 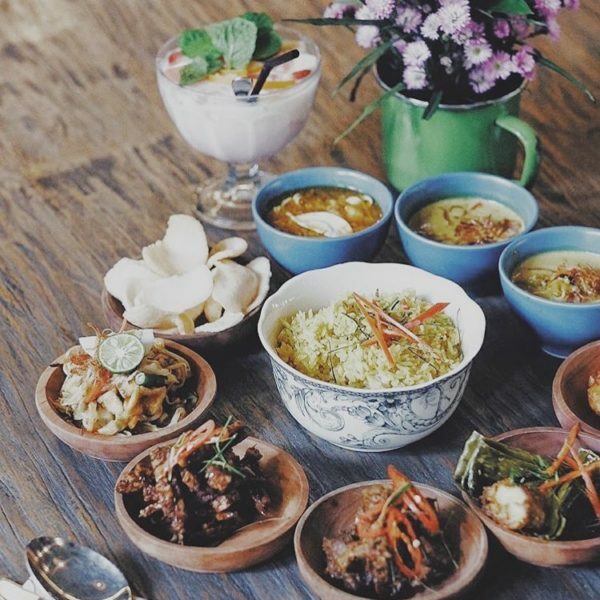 Come with friends and family and much on the traditional Indonesian ‘rijsttafel’ so you can try a little bit of everything. Yummy! 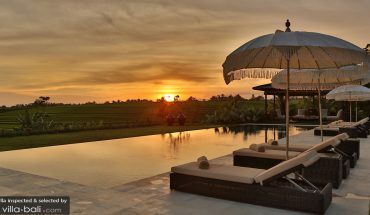 This hilltop villa features magnificent views of the ocean and the unspoiled natural surroundings of Jimbaran and South Bali. Villa Cara is a multi-level contemporary luxury villa with modern comforts, clean and chic interiors and 5 decadent villa suites to retreat to at night. Boasting a TV lounge, an infinity pool and a private chef cook, things are quite wonderful at this holiday residence in Jimbaran! The spacious, combined living and dining room features an integrated Western kitchen and the design of the villa is hypermodern with floor-to-ceiling windows and doors, maximizing the ocean views. An amazing stay in Jimbaran Villa Cara is! 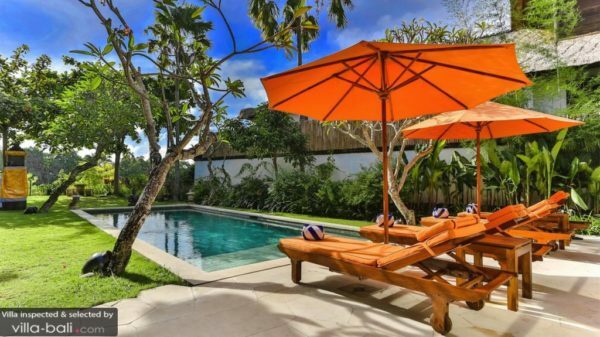 Villa Cara is located in the hills of Jimbaran, just a 10-minute walk away from the beach. Villa Adenium is a 3-level luxury residence perched on top of a hill in Bukit Peninsula, Jimbaran. 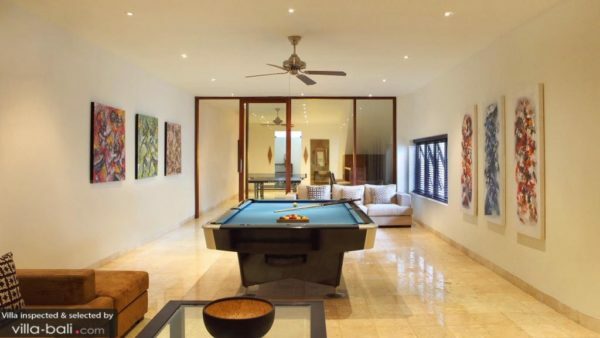 This villa offers the full leisure package, featuring a private massage room, a gym, a cinema lounge, an entertainment room with a billiard table and a kids’ playing room with toys and game consoles. Youngsters, teens, parents and grandparents, Villa Adenium makes holiday dreams come true for all members of the family. All 4 bedrooms are designed with full-length glass doors and windows overlooking the garden, the infinity pool and the ocean. The rooftop terrace is the perfect spot for candlelight dinners under the starry night sky. Kids will love the cinema/playing room and parents will adore the chic interiors and the magnificent views. Located up in the hills, the surroundings are still mostly raw and unspoiled. 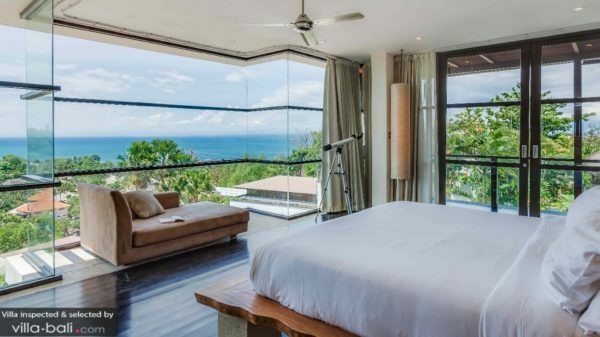 The villa is found inside the secure hillside complex of Temple Hill Upper II and beloved Jimbaran Bay is 2 kilometres (a short 5-minute drive) away. The international airport of Bali is 8 kilometres away. 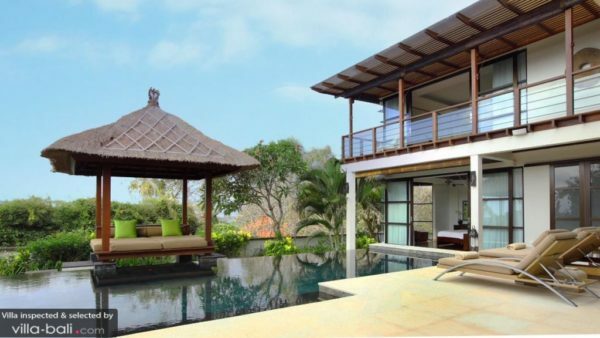 Villa Yasmine is a real homey vacation home with a private pool, tucked away in a villa complex close to Jimbaran Bay. Traditional and modern elements of living are combined to provide you with the best of both. The villa is surrounded by hillside greenery to enhance the feel of a nature retreat close to the ocean. The living pavilion features a traditional ‘alang alang’ thatched rooftop and it is furnished with teak furniture and tribal artwork. The best spot in the house at the outdoor lounge area on the upper floor, boasting awe-inspiring views of Jimbaran Bay and all of its flickering lights after sunset. 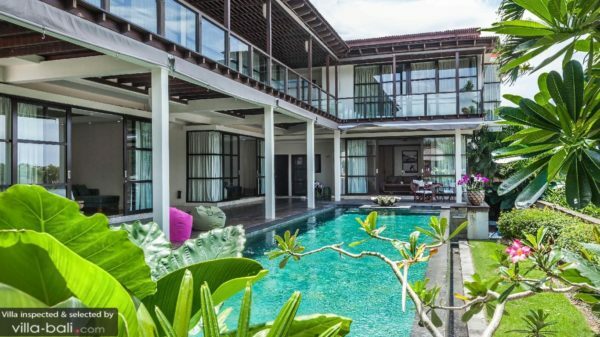 Villa Yasmine is part of Karma Jimbaran Villa Complex, located close to Jimbaran Bay. Jimbaran Corner Shopping Center is reachable on foot. Jimbaran is a bit of a stretched out area in the southern tip of Bali and the access to the islands international airport is superb! 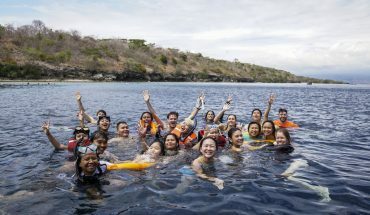 Nusa Dua, Uluwatu, Kuta, Seminyak and Sanur are all very easily accessible from Jimbaran, making it a perfect base to explore the highlights of South Bali. It takes approximately 10-15 minutes to get to the airport from Jimbaran Bay. The easiest way of getting around is by motorbike or a private car and driver (your villa manager can assist in renting a scooter or arranging a driver). 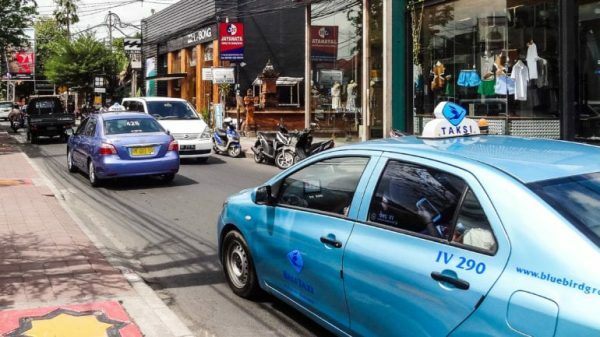 Taxis tend to be expensive (there are no meter taxis around) and Grab Car, Uber and Go-Jek are banned at most places in this part of Bali. So, rent a scooter and go explore the south or enjoy the luxury of having your own personal driver!